The lovely people over at the Vegg sent me a sample of their product, the world’s first vegan egg yolk, to review. I was super excited because I had seen some of the dishes made with their product and it all looked yummy, plus the company seems to have a good heart since 10% of their net sales are donated to Compassion Over Killing. Once it arrived in the mail, I made the one eggy thing I had really been missing since going vegan, scrambled eggs. Sure, tofu scramble is good and all, but still not the same thing. 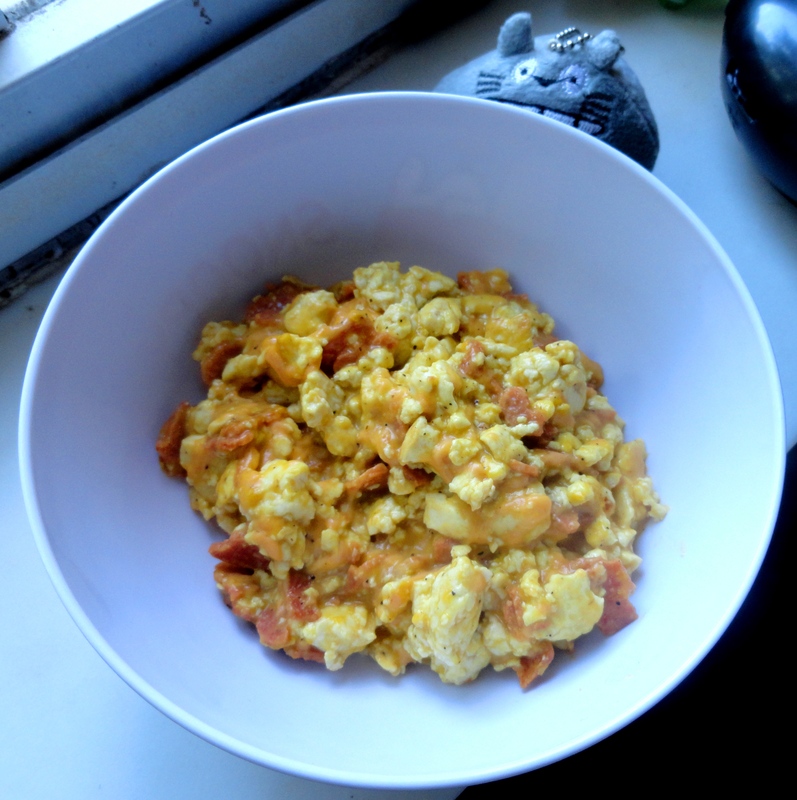 I followed the Vegetarian Recipe Club’s recipe for the scramble, using only 3/4 cup of water and minus the green onions, and then to make it similar to my pre-vegan dishes I threw in a sprinkle of Daiya cheddar and chopped Light Life “bacon”. It was SO GOOD. I cannot emphasis how delicious this was and creepily similar to eggs. The texture of the tofu was eggy, but the flavor of the Vegg was what made it all stand apart from a traditional tofu scramble. After making this, I decided that even if every other dish I made was a failure, this made it worth buying. I know that the Vegg boasts many uses to replace egg yolk and even has a spherification method, but since I never liked egg yolks in my omnivore days, I will not be reviewing that use of the product. But the next way I used the product was to make a Vegg patty, which I made by mixing 3 tbsps of Vegg powder, 1 cup of water, and 1/2 cup of flour. I then cooked them like pancakes, using a oiled skillet and flipping them over once bubbles began to rise on the surface. 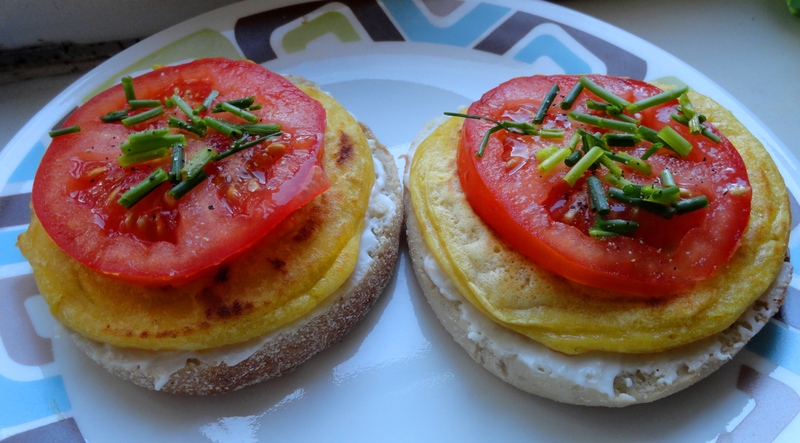 The patties were then put onto an open faced English muffin with some Vegenaise, tomato slices, and chives. These were very yummy and reminded me of a good version of the uber-processed egg patties that are used in sandwiches at fast-food joints. These patties would be fantastic in a biscuit with a little margarine. 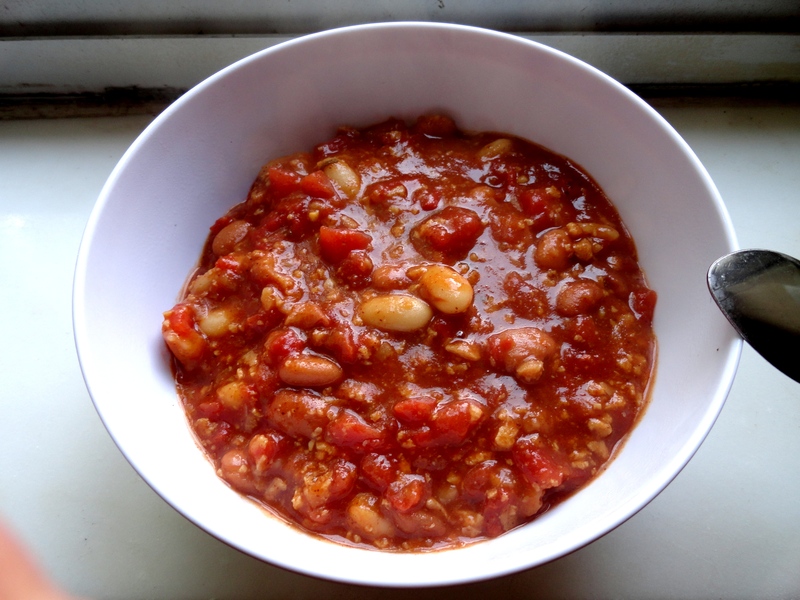 And the last thing I made with the Vegg was my own recipe! 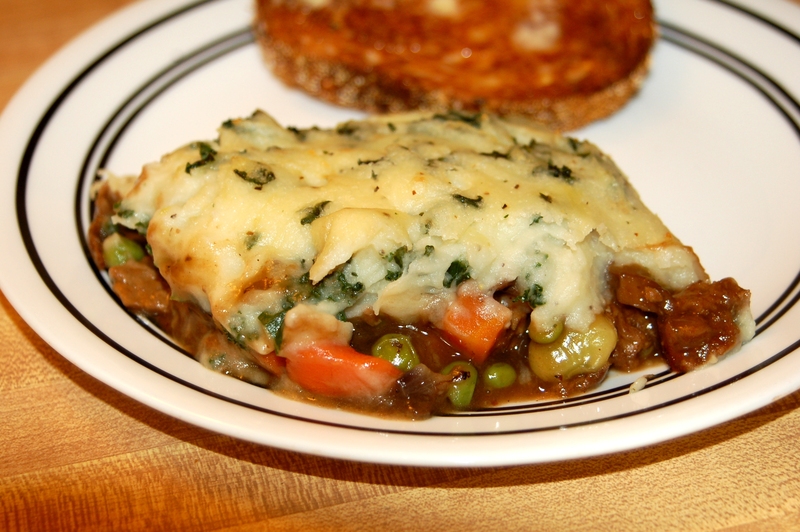 The recipe is for Vegg breakfast bites, kinda like a quick thing to grab in the morning if you don’t have time to sit down and eat. Plus since these babies pack 6 grams of protein per muffin, it’s a filling way to start off your day. In a food processor, blend the Vegg and water, then slowly add in pieces of the tofu until a smooth texture is achieved. Put the tofu/Vegg mixture into a bowl and mix in the rest of the ingredients. Grease a muffin tin and pour the mix into the pan, and it should make about 10 breakfast bites. Bake for 20-25 minutes, checking for done-ness by an inserted toothpick coming out clean. Let them cool, then enjoy! These are surprisingly good with dipping sauces, I enjoyed mine this afternoon with some ketchup and “honey mustard” dip. So all in all, I would definitely recommend trying the Vegg. It is fantastic scrambled, fried, baked, or cooked many other ways. Check out the Vegg’s website for information on where to it is available in your area. I haven’t graduated yet, but I have been doing dual-enrollment at the local community college to get prepared for going off to the University of Montevallo in the fall. Every Monday and Wednesday I have a 2 hour break inbetween classes around lunch time. Instead of opting for eating out twice a week, I decided I’d save money (and be healthier) by making my own lunch. So I invested in an Aladdin black 24 oz. lunch bowl to carry my homemade goods around with. 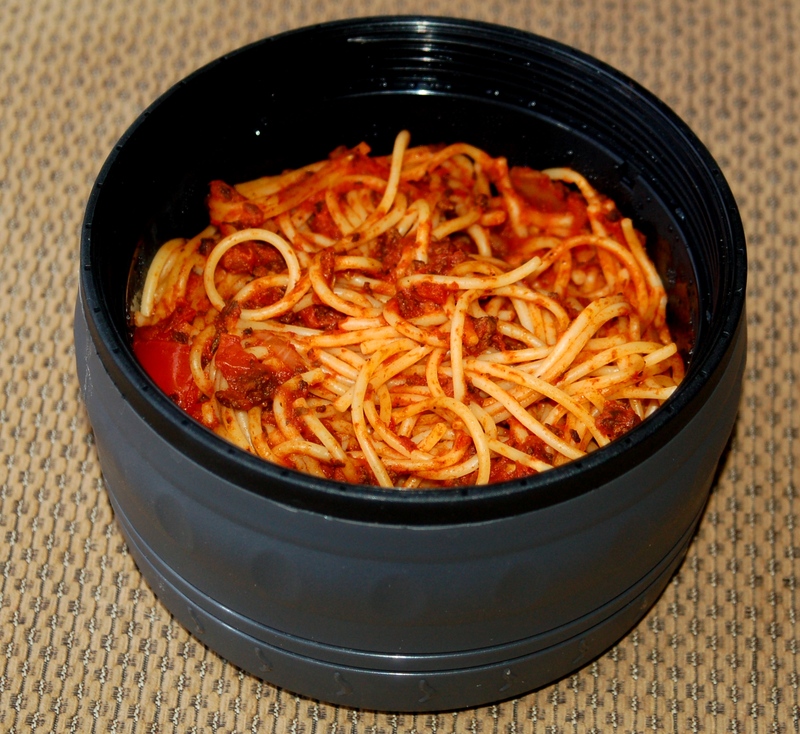 Above is one of my latest meals to make for lunch, spaghetti with homemade “meaty” tomato sauce. It stored nicely and kept pretty warm for the 3 hours it stayed in the car until my break. Okay, I’ll admit this isn’t the prettiest picture. But it was a very yummy lunch. 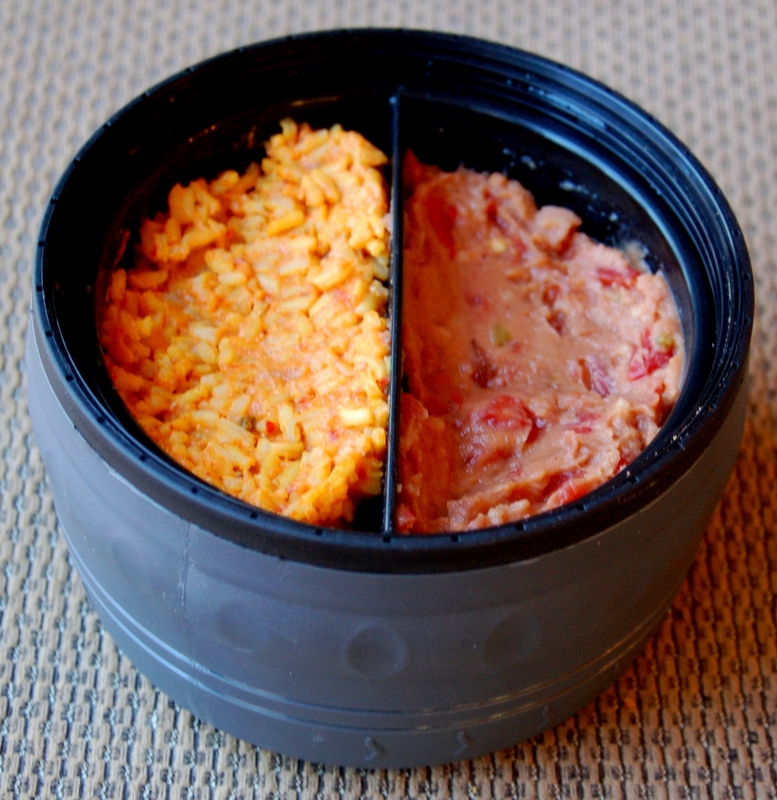 It was Spanish rice, and refried beans mixed with freshly chopped tomatoes and peppers. 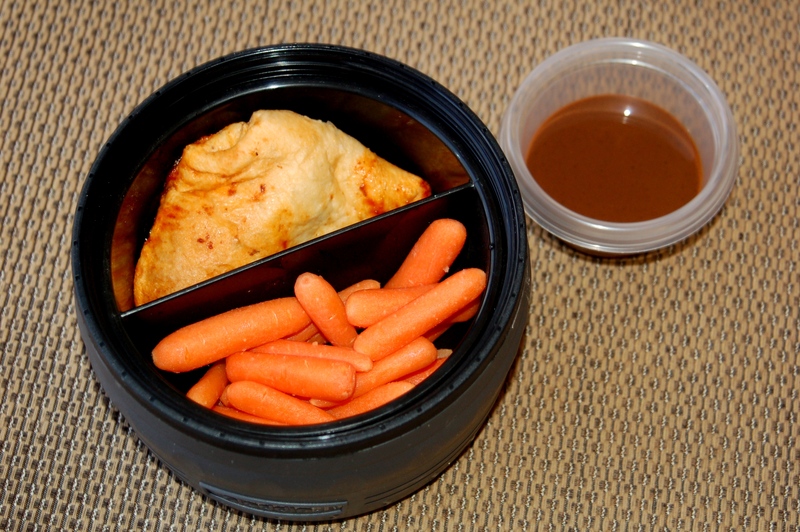 Lastly, I had a homemade pizza roll and carrots with balsamic sauce. I love being able to store all these fresh veggies away for lunch and my lunchbox keep them nice and cool. Recently, the people at Gardein were kind enough to send me some coupons to try three of their products for free. I’ve reviewed one of their products before, and I’m glad to have the opportunity to do so again. When I saw this package of vegan barbeque I was immediately excited. 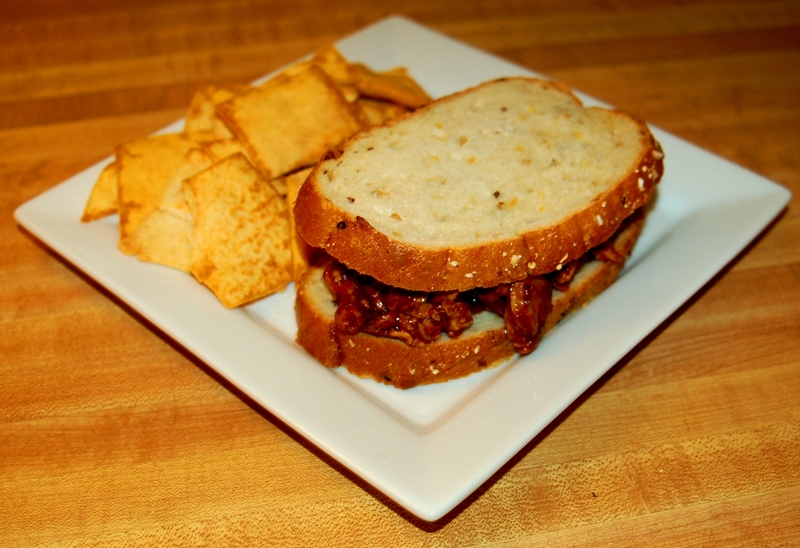 I loved eating barbeque in my pre-vegan days, so when I saw how good the Gardein BBQ Shreds looked in the package, I couldn’t wait to try it out in a sandwich. I got home and decided to eat some of the barbeque for lunch. I cut open the package and was hit with a smell. It smelled sorta like barbeque sauce, but way sweeter, like they had added too much sugar. Not willing to let the off putting smell ruin it, I followed the instructions on the back and cooked the pulled shreds in a small pan on the stove. 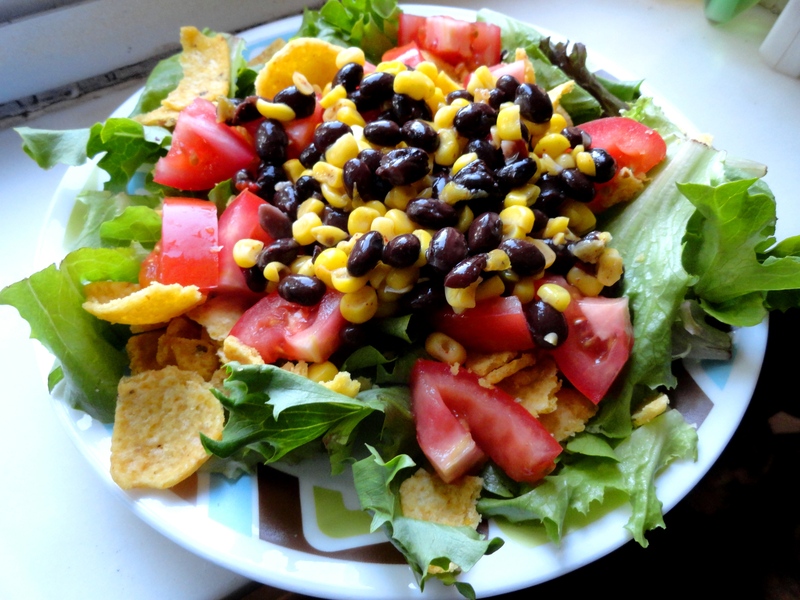 I toasted the bread, opened some pita chips and ended up putting together a quick and delicious looking lunch. Sadly, the sandwich wasn’t as yummy as it looked. I took a bite and was shocked by how sweet the barbeque sauce was. 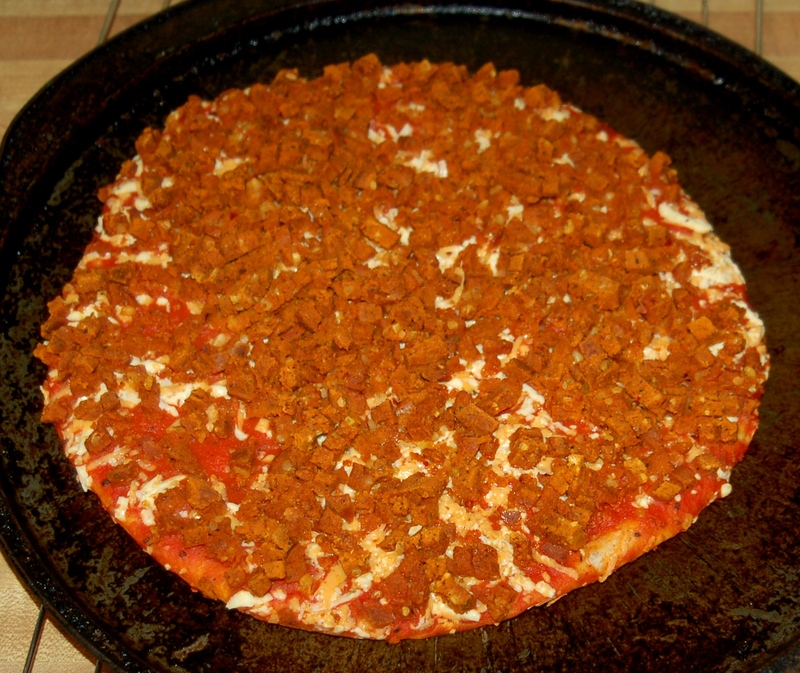 It tasted pretty much like brown sugar, tomato sauce and some seasonings were just mixed together. To make matters worse, the taste stays in your mouth for a while afterwards. On the other hand the texture of the shreds were great. Slightly chewy, but still with the a soft shredded feel, it reminded me a lot of pulled pork. So all in all, the sauce was gross and over powered the entire meal, but the shreds were good. 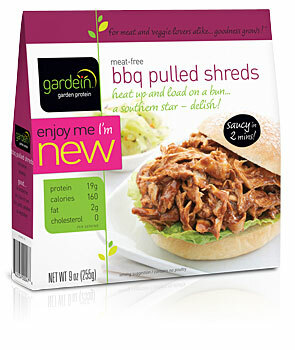 If Gardein would sell the shreds dry, I would totally buy some, but as long as they continue to add that barbeque sauce, I won’t be buying this product again. 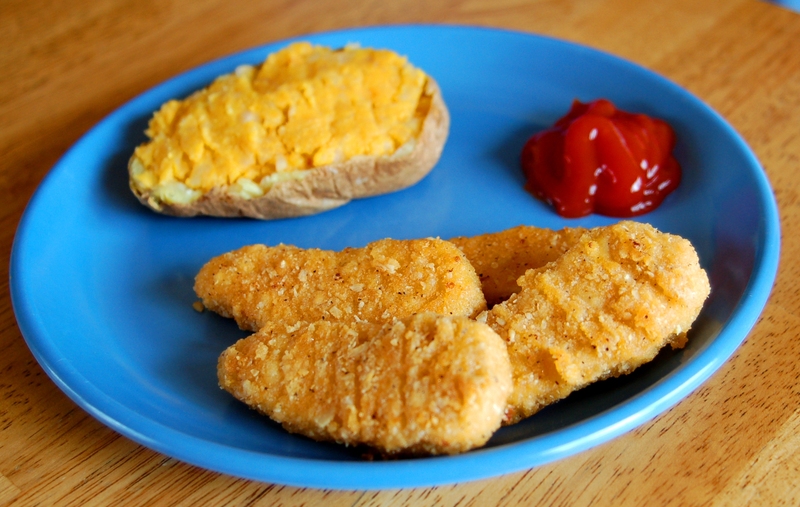 I have to say, these breaded strips are the best vegan “chicken” product I’ve ever eaten. 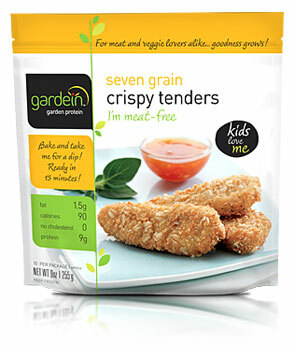 Boca, Morningstar, Gardenburger, nothing from these brands even compares to these tasty crispy tenders by Gardein. They taste so much like chicken that you should be able to trick any omnivore into thinking these are the real thing. They taste how I remember chicken, and have an amazing texture. They’re chewy and juicy with a crispy breading that pulls everything together. 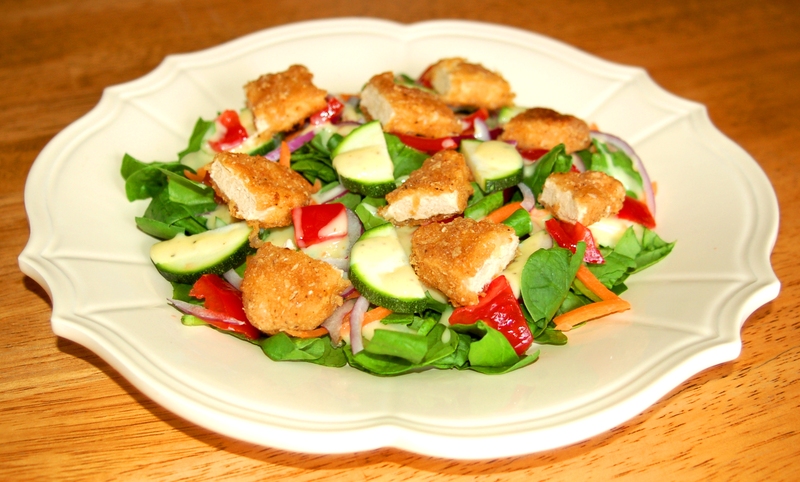 Whether you eat them plain with a dipping sauce, put ’em in a casserole, or put them on top of a salad, there’s no wrong way to eat these tasty chick’n strips . Since they’re low in fat (only 1.5 grams per serving!) 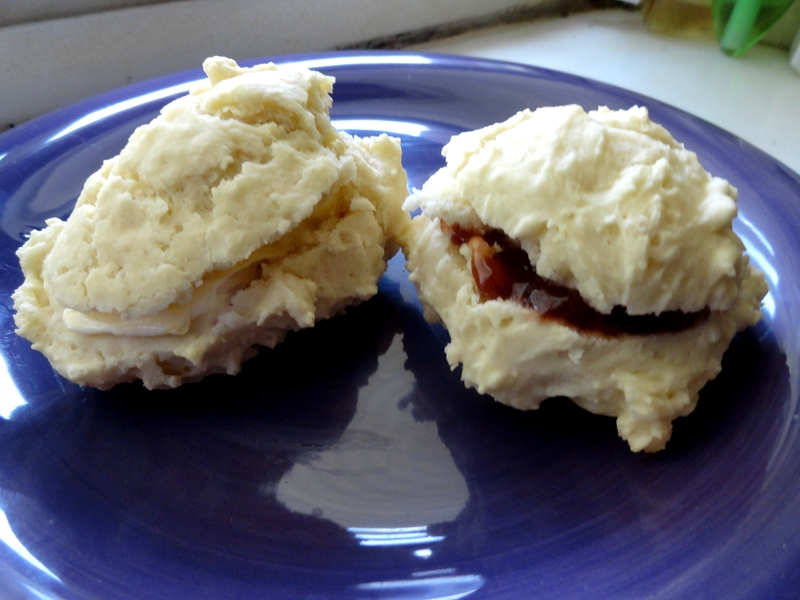 and also high in protein (9 grams per serving), you can indulge in these without having to worry about your waist-line. So if these are available in your area, go buy them now! If they aren’t available in your area… Well then, I hope for your sake that they come soon, because these are truly delicious. I previously confessed my love for barbeque while reviewing BBQ Shreds and I’m glad to say this barbeque product does not disappoint. Each package comes with four skewers (each with four pieces of “meat”) in a sauce. I was warily eyeing the sauce, afraid that it was the same kind that the BBQ Shreds had come packed in, but thankfully it wasn’t. The barbeque sauce was quite yummy, with a hickory smoke flavor. The “meat” itself reminds me of roast beef. It’s very tender, but doesn’t fall off the stick after being cooked. 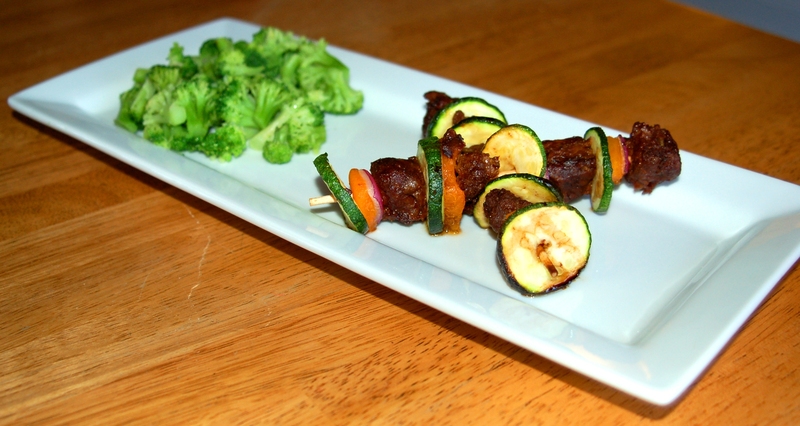 I tried it first by putting the pieces of “beef” on longer shish kabob skewers along with slices of zucchini, fresh apricot, red onion, and drizzling it with balsalmic vinegar and olive oil. I then baked it at 400 degrees for 16 minutes, flipping half way through the baking time. The result was sooo good. The meat was tender and moist, with a smoky kick under the sweetness that came from it being baked next to the apricot slices. I would seriously recommend trying it this way, because it was delcious! The second way I tried the bbq skewers was in a shepherd’s pie. I baked the skewers as instructed on the back of the package and added it to mushroom gravy (I was lazy and used Campbell’s canned mushroom gravy, which is accidentily vegan) along with corn, lima beans, peas, green beans and sauted onion. I added the gravy mixture to a casserole dish, then topped it with colcannon (mashed potatoes + sauted kale = colcannon). I placed it in an oven pre-heated to 400 degrees and let it bake for 15 minutes. This too was very yummy. Pretty quick and easy to throw together (especially if you’re using left over colcannon), I can see myself eating this quite often in the future. So all in all, Gardein had two hits and one miss. The Crispy Tenders and BBQ Skewers were very yummy and I would definitely recommend that you try them. The BBQ Shreds on the other hand need their sauce changed, before I’d recommend it to anyone. 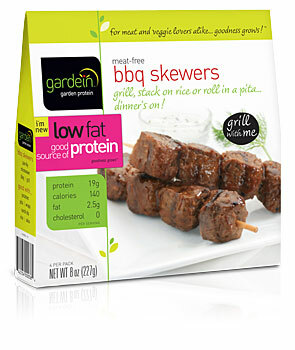 new Gardein product caught my eye. Now, I’m always a sucker for anything stuffed with cheese. Since going vegan that’s something I’ve had to miss out on, but not anymore! 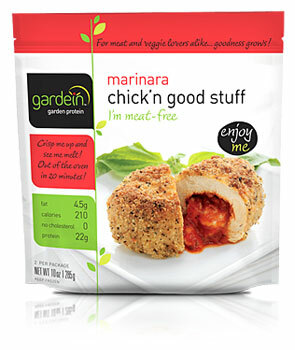 Gardein has come out with a chick’n breast stuffed with Daiya cheese and marinara sauce, and it’s amazing! 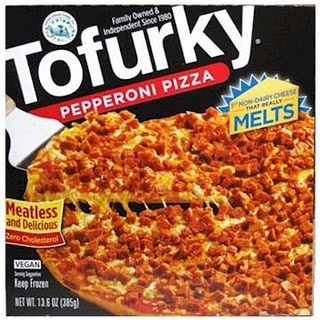 All of the Gardein products I’ve ever had have been suprisingly meat-like, but this one would fool any omnivore and the Daiya soy cheese was delicious! Now I know why everyone has had such rave reviews for this new vegan cheese. It tastes like the cheese I remember, and mimics the stringy-ness of cow cheese, that no soy product has managed to recreate until now. If you see this product, grab it up! It’s super delicious.